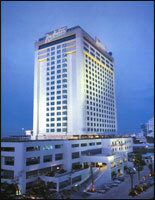 Radisson Hotel Bangkok, a Superior First Class Hotel, is located along the Rama IX Road as well as adjacent to the newly built Express Way. Hence, it will take approximately only 30 minutes to get to the Don Muang International Airport and to the major shopping areas. This would be a great advantage for a 1 or 2 nights stopover in Bangkok because less time is spent in the traffic. To make thing easier, we provide complimentary scheduled shuttle bus service which runs from the hotel to the wholesales market called Pratunum Market, the Emporium Department Store where you can find all sorts of brand names, the Duty Free Shop which are located at the World Trade Center, the well known night life entertainment area " Patpong - Thaniya " and the Weekend Market which sell everything that you can think of, from household goods to handmade products. Radisson Hotel Bangkok features 431 Standard Rooms and 17 suites-13 Business Suites, 2 Honeymoon Suites and 2 Grand Suites - all meticulously designed for comfort and total privacy. The tasteful decor is the perfect combination of traditional Thai elegance and contemporary flair, with an accent on serenity and exquisite beauty. All superbly appointed guestrooms feature stunning teakwood furniture and supreme-sized beds, with great emphasis on international-class amenities. Every room comes with digital-control air-conditioning, international direct dial telephones with a voice mail message service, an executive writing desk, a private electronic safe deposit box, an electronic key card, satellite & TV, and 2 built-in, in-room movies, wardrobes with full-length mirrors, plus separate shower and bath. A special deluxe feature fixture is a hot bar installed in the bathroom for hanging clothes dry within four hours. Best of all, a fully-stocked refrigerator and mini bar, along with coffee & tea-making facilities are also provided in every guest rooms for fabulous comfort and the utmost privacy of all guests. The Premier Class Floors, occupying the 21 st to 23 rd floors, are reserved for travelling executives to enjoy the special privileges which Radisson Hotel has to offer. All rooms are handsomely designed especially for guests who demand luxury, perfection and personalised service. In addition to first class accommodation and facilities, the Business Class Floors offer a wide range of unsurpassed services, including a wake-up cup of tea or coffee with daily newspaper, free pressing, photocopying facilities, shoe shining, personal butler, English newspapers and magazines. Second-to-none is the Hotel's Business Lounge on the 22 nd floor where express check-in and check-out desks are located. Assistance with appointments, airline reservation service, and other secretarial services are also exclusively provided by well trained staff. Here, guests can enjoy complimentary coffee & tea and cookies served all day, while admiring panaromic views of Bangkok in a calm atmosphere. The Radisson Hotel's Business Center is specially designed to cater to the needs of discerning businessmen who value efficient and professional services. Fully equipped with modern office facilities, the Business Center efficiently provides a host of business and communications service. These include full secretarial services, airline reservation services, facsimile transmissions, and photocopying. In addition, current newspapers, periodicals and business directories are also on hand. For those who need to hold conferences with their business partners, a private conference room for small meetings is available. The Lobby lounge is a perfect rendezvous where guests can linger over afternoon tea and an aperitif, or relish delightful cocktails in a casual atmosphere, all enlivened with the Thai hospitality of courteous staff. Enjoy a dazzling variety of Thai and international specialities in the elegant and relaxed surroundings of the Radisson Coffee Shop, plus a la carte menu specially prepared to satisfy the varying palates of all guests. A wide selection of freshly baked bread and pastries can be savoured to guests utmost delight at the Radisson Bakery. All-time favourites like coffee cakes, blueberry cheesecakes, cookies, and home-made chocolates are offered to satisfy Bangkok's discerning lovers of the finest baked delicacies and confectionery. Located on the 24 th floor, Tubtim Siam is an unusual restaurant to say the least! The charm of stylish Thai-decor and luxurious furnishings adds a lot to the experience of dining. At Tubtim Siam, the choice of traditional Thai cuisine is beyond compare. Guests can savour an incredible variety of Thai delicacies prepared by culinary experts in a truly magnificent ambience, while enjoying authentic Thai classical music and dance. Fook Yuan is a superb spot where connoisseurs of Chinese food can always find the best in traditional Cantonese delicacies. All mouth-watering dishes are perfectly prepared by a master chef in a truly unique way to create a myriad of taste sensations, making the restaurant well worth seeking out. Nishiki serves an exotic array of great-tasting Japanese cuisine in the charming "Japanese-style" seating areas, while creating an atmosphere that is hard to define. With the chef taking painstaking care over its preparation, the clientele are ensured of a superb dining experience, thus making Nishiki a "must-try" restaurant for Bangkok's gourmets. Enjoy breathtaking views of beautiful sunset and the skyline of the city from the charming Sky Lounge on the 24th floor, an ideal retreat much sought after by lovers of soft music, refreshing drinks and delicious light snacks. For a fun-filled evening after a tiring day's work-how about coming down to blackie Sports Pub and enjoy a glass of cold draught beer in a fun and casual atmosphere. Plus a chance to watch live TV coverage of your favourite sports on UBC. And that's not all. Enjoy a selection of in-door sports and the warm hospitality. Celebrate there and relish the nightlife, experience in total splendour. Open daily at 16:00-01:00 hrs. The Radisson's Health Club is an integration of a gymnasium, with qualified fitness instructors and an aerobics studio, with incorporated high-tech workout equipment, jacuzzi,spa, private massage rooms, steam and sauna rooms. For complete relaxation, a deliciously inviting swimming pool is a perfect spot for a refreshing dip during calm mornings and hot afternoons. Whether relaxing by the pool or just lounging around, guests can enjoy sipping cool drinks from the Poolside Bar, while savouring tranquil leisure time in a bright and breezy atmosphere. From the moment guests enter the Radisson Hotel Bangkok, they will certainly be impressed by its luxurious settings which are further enhanced by cordial Thai hospitality. The truly sumptuous Radisson Hotel presents a harmonious blend of tranquil colours and superb furnishings, while offering both comfort and style. The artistic interior of the marble lobby features a wealth of architectural elegance along with extensive use of Roman-style columns thus adding a lavish and welcoming atmosphere to the Hotel. The entire ambience is undoubtedly elegant and pleasent, making a visit at Radisson Hotel an unforgettable experience. To cater for every social occasion, Radisson Hotel provides luxuriously appointed function rooms of varied sizes and a spacious pre-function area. All rooms are fully equipped with modern audio visual equipment, conference and banquet facilities. The Grand Ballroom, with a seating capacity of 1,000 persons, is a frequent venue for grand banquets and corporate seminars. Five other medium-sized function rooms are perfect for smaller meetings and private functions. To ensure truly memorable social events, impeccable service and delectable cuisine are provided in a pleasent atmosphere, coupled with graceful charm of the Thai staff.